Located on the edge of a pine forest, just 80 metres from the beach and a stone's throw from the resort's pedestrian zone and the lively Allée des Pins with its attractions for holidaymakers of all ages, Le Maritime is the perfect base for your summer holiday. 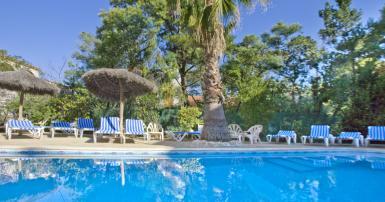 Right in the bustling heart of Argelès-sur-Mer and a stone's throw from the beach, Le Maritime is a comfortable hotel with its own swimming pool. Renovated in 2014, our 34 comfortable rooms all have a terrace. Some are suitable for families of up to four people. Cancellation and prepayment conditions vary according to the type of room. Please select the dates of your stay and consult the conditions for your choice of room. Free! A bed for babies aged under 3 is provided free of charge (no food included). On request and subject to availability. For older children and adults, an extra bed costs 15 euros per person per night (no food included). We also have family rooms that sleep 4 people. Please call us on +33 (0)468 815000 for more information. .nice room with a balconny. Just next to the ea. Very kind approach the reception. We'd had a lovery time! Avis laissé le 02 2018 par C C.